paint chips and pencil shavings: Power Horse unveiled! Behold! Power Horse! The horse with HORSE POWER! Colored version soon to follow! As a reminder, this is the first place that anyone has seen Power Horse. That's because I created this character and theft will not be tolerated. Please respect my characters. Storyboards for issue #1 in the works today. 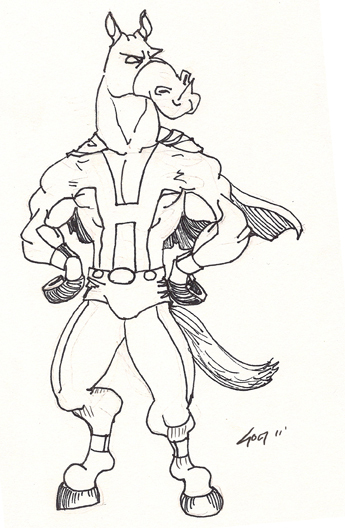 Then I am planning a full reboot of all Power Horse titles. I am calling this reboot The New 52 week lag project. Stay tuned for more Power Horse and more HORSE POWER! This one's face reminds me of the horse from Tangled. And if you enjoy children's fantasy films as much as I do you will know that is a compliment..